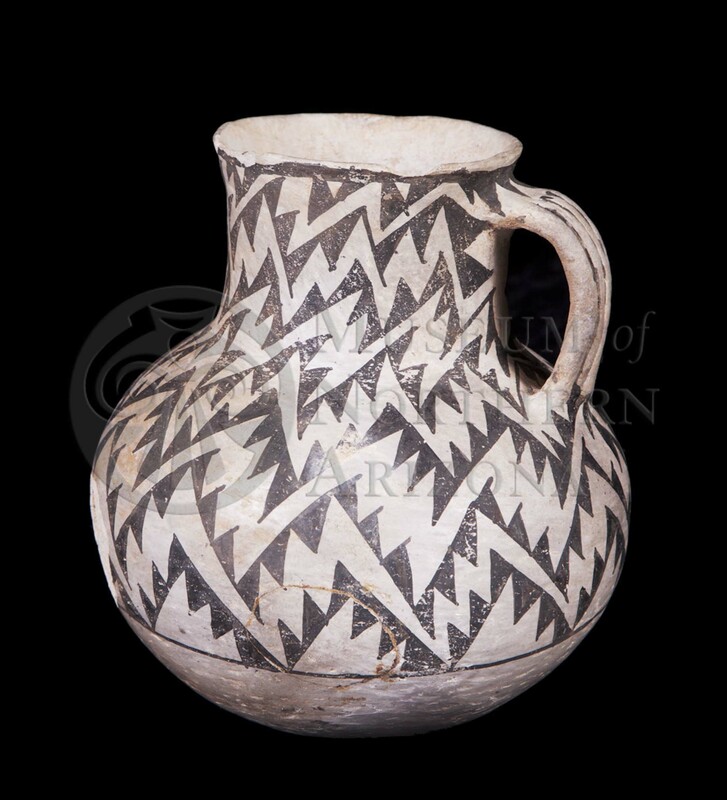 Escavada Black-on-white pitcher from the Museum of Northern Arizona collections. Click the image to open the Escavada Black-on-white gallery. Escavada Black-on-white is a Cibola White Ware type characterized by designs painted in the Sosi style. Sosi-style designs are bold, with broad lines and large solid elements. Core Color: Light gray to white. Surface Finish: Decorated surfaces are well smoothed, often slipped and polished. Forms: Bowls (predominate) and jars. Paint: Black to dark gray to reddish brown, matte. Design: Bold, solid designs, parallel solid bands often forming nested chevrons, running bands of pendant triangles and large triangles, flags or pennants. Triangles occur in many forms, the commonest being bards or pennants hanging from a line. Negative lightening common. Occasional steps and negative steps. Comparisons: This type is often confused with Puerco B/W. Escavada design elements include bold, solid designs that tend to be angular to one another and solid lines tend to have barbs; Puerco designs tend to run parallel or at right angles to one another. Also, solid lines tend to be thicker on Escavada. Kintigh, Keith, Greg Schachner, and Josh Watts. (2003) El Morro Valley Prehistory Project Field and Laboratory Manual. Arizona State University, Tempe.